Little Itty Bitty Mo Ditty is HOME! She has been home since she came into rescue in December 2017. She knew it and she knew that she had found her “person.” It just took her Foster Ma a little longer to realize it. Yes, I am Mo Ditty’s person. She is always right by my side, by my desk, by my bed, beside me on the couch, looking up at me with those big brown eyes, patiently waiting for a kind word or gentle touch. 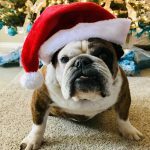 It’s not that I didn’t love her or want her, but my job as a foster parent is to bring these homeless Bulldogs into my home, then love, nurture and help them find their forever families. And that’s exactly what I’ve been doing with Mo Ditty for 16 months – loving and caring and hoping and waiting. We can’t adopt every foster dog because then our homes would be full and we wouldn’t be able to help the next one in need. But Mo is almost 10 and I think it’s time to make it official. Sassy, stubborn, (sometimes) grouchy, momma-loving, fur-hating, Little Itty Bitty Mo Ditty is HOME! Welcome the very petite Mo Ditty to our rescue family! Ditty was rescued by a loving family and they have had her for several years. Due to a move and some other family changes, they decided it would be best for her if she went to a different home. Ditty is a very tiny and sweet girl of 8. She weighs only 35 pounds. She has some skin issues and has developed a grouchy attitude of late. 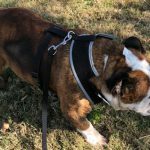 Sometimes that combination can be caused by a thyroid problem, especially in a dog her age. So she will get a complete checkup including blood work, and will be spayed. She has the calmness of an older dog, but still has plenty of energy. Her family said she would recently run through their pasture with the other dogs. If a wiggly nub of a tail still means anything, then she has plenty of energy, life and love left to give. She would love to come do all that at your house. 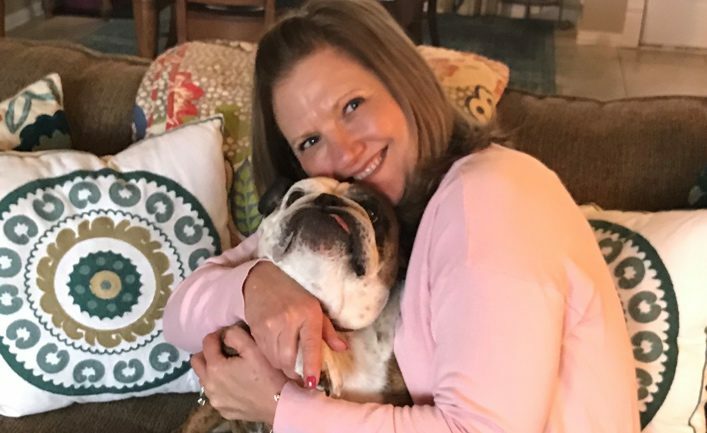 12/31/17 Update: Mo Ditty is saying bye bye to 2017 and hoping that 2018 brings her much luck and her new forever family! 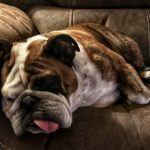 Mo “Bitty” is the tiniest little girl – weighing only 35 pounds – the perfect lap Bulldog! She is house and crate trained and “tolerates” the other fosters in our home, but can get a little snarky with them if they don’t leave her alone. She responds quickly to correction at those times. 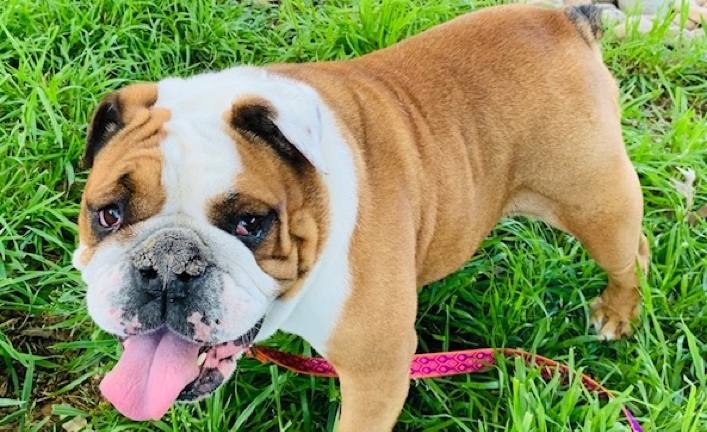 I think she will do better in a quiet, laid-back household where she can be right beside her new momma or papa all the time. 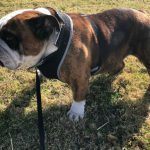 So, let’s get this sweet, little lap Bulldog her new forever family – she’s waiting for you! 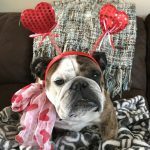 1/26/18 Update: Foster girl little bitty Mo Ditty is looking for her Valentine’s Day sweetheart and hopes that you are looking for her too! 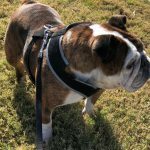 2/5/18 Update: Hi, all you Bulldog lovers! This is Mo Ditty checking in. Or as my foster mom likes to call me, Little Itty Bitty Mo Ditty. 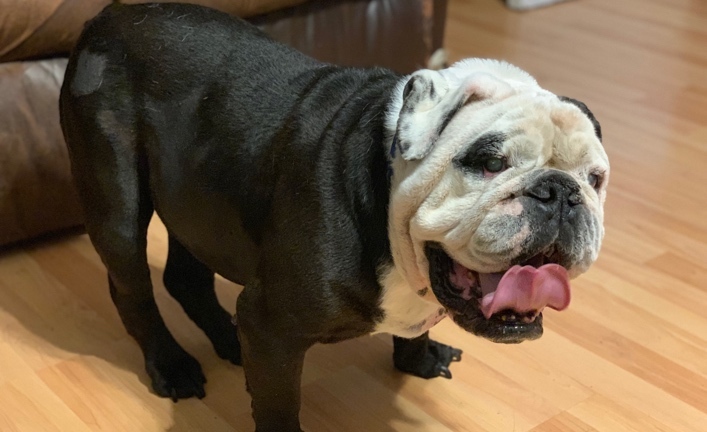 Foster Ma has been pretty busy lately, so I thought I’d send my own update in because even though I like it around here, I know it’s only temporary and I’m ready to start my forever life with my furever family! I guess you guys think I’m a “senior” gal because I’m 8 years old – but believe me, I’m still full of life and have lots of energy. I keep Foster Ma’s horses in line by running back and forth at their fence every morning. 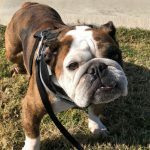 They think it’s funny and keep teasing me, but I don’t give up until Foster Ma makes me stop. Geesh – those darn horses! 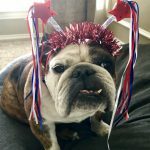 7/1/18 Update: Little Itty Bitty Mo Ditty is celebrating Independence Day a little early and hopes that the Lone Star Bulldog Nation has a safe and fun 4th of July week! Oh, and she also hopes that her forever family finds her soon. 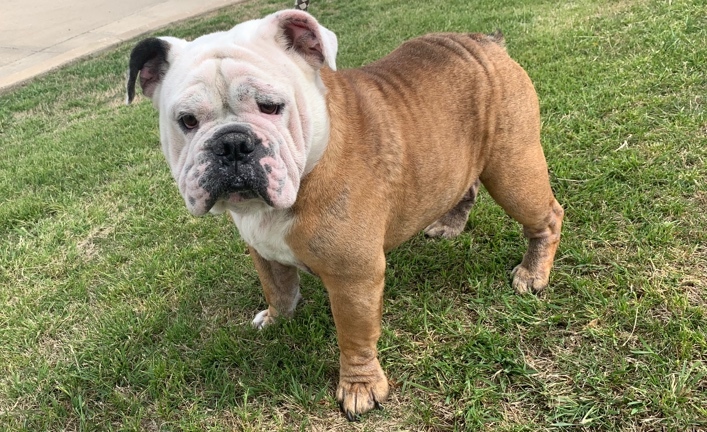 She has been in rescue since December and thinks that’s just about long enough and is ready to start her new life with a brand-new family. She asked me to remind everyone that she really wants a mom. She’s OK with a mom and a dad, but she really, really, REALLY likes moms . 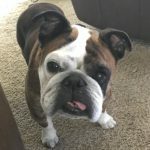 So, hopefully there’s a mom out there looking for a sweet, little itty bitty Bulldog to love on, spend their days together and live happily ever after! 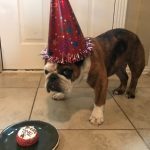 9/8/18 Update from Mo Ditty’s foster momma: I just realized I missed Mo Ditty’s July 6 birthday! I found her registration papers in her foster care paperwork and they had her actual birthdate on them. Little Itty Bitty Mo Ditty has gracefully turned 9 wonderful years young! We celebrated with a special cake, birthday hat and spa day. As you can see (or hear) Little Miss Mo Ditty, is a messy little eater, but she really enjoyed her birthday cake and special day and is excited to see what her new year brings! Happy Birthday, Little Itty Bitty Mo Ditty! 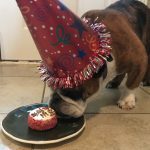 12/1/18 Update: Today marks one year that Mo Ditty has been in rescue. 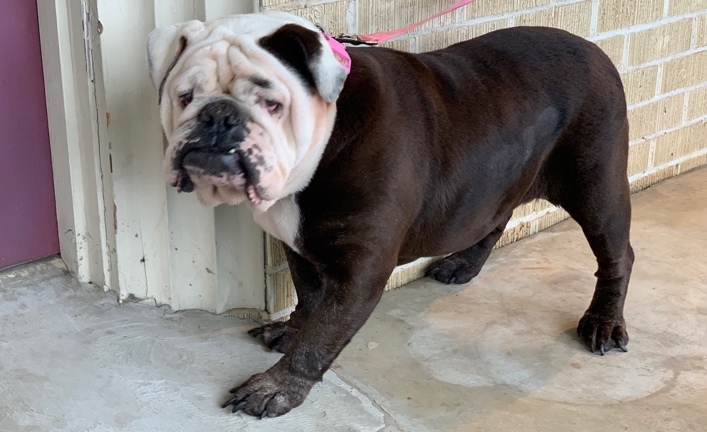 She’s a senior lady waiting patiently for that perfect forever family to live out her golden years in love and comfort.